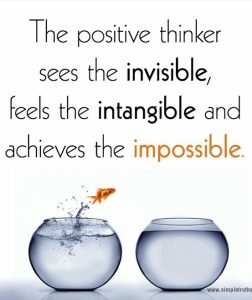 The Positive thinker sees the invisible, feels the intangible and accomplishes the impossible….I love that!!! This is the realm we should all live in, it’s the realm I am teaching about in this class on Infinite Possibilities, it’s the God realm that is ours to be a part of. Here is a quote from the book “The Last Arrow” which is very inspiring. Where are you? Can you dream big? Can you live big? Can you walk with God to live a big, full life? These are the things we need to ask ourselves every morning when we wake up. Casting off Religious limitations and reaching for the Infinite Possibilities with a God Who can get us there.